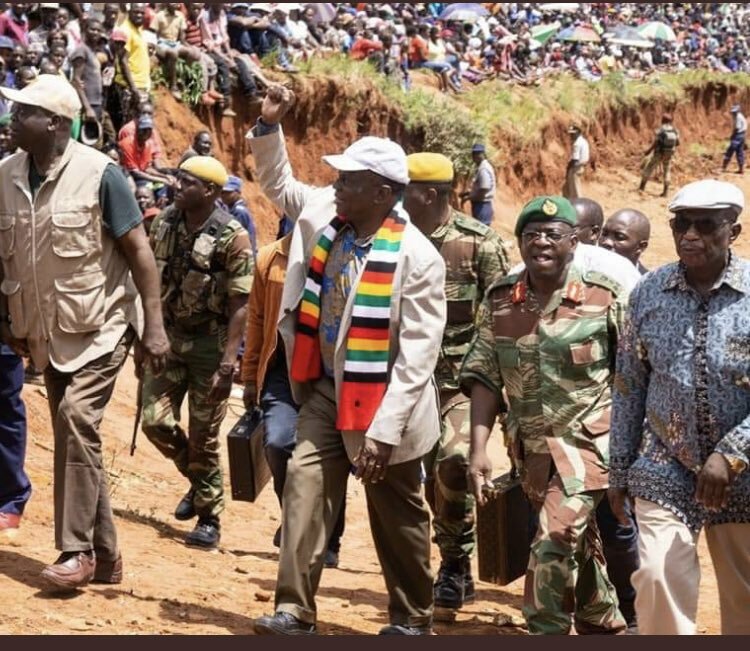 On 20 March 2019, President Emmerson Mnangagwa visited the cyclone Idai victims in Chimanimani. The President was accompanied by VP Chiwenga and other senior government officials. He was in Chimanimani to assess the damage caused by cyclone Idai. President Mnangagwa made assertions that the government will soon unveil a rural housing policy. The rural housing policy will ensure the building of better houses that are to be deemed strong and durable. Chimanimani and Chipinge communities are mainly characterized by underdevelopment in almost all aspects of life, and are in a critical condition. Yet, the vulnerability and risk levels of these communities appeared to have been poorly understood before the onset of the cyclone. As of 20 March 2019, Cyclone Idai had destroyed 150 houses in Chimanimani and 234 houses in Chipinge whereas 8 bridges in Chimanimani were washed away, schools, crops, livestock were not spared from the fury of cyclone Idai. Close to 200 people lost their lives and close to 700 are reported missing whilst 136 people are marooned. In Chimanimani, there are 308 displaced people and 600 in Chipinge. At least 11 719 people were affected one way or the other. This left the two districts with difficulties to recover on their own without external support. Restoration of the communities’ housing needs is a daunting task. Chimanimani and Chipinge districts are victims of piecemeal and haphazard human settlements spurred on by political considerations for the retention of power. In Rusitu, people were settled by Zanu PF stalwarts. The people who were illegally settled on plantations like in Rusitu could not invest in constructing resilient structures for fear of eviction. This exposed the communities to debilitating effects of a natural disaster like cyclone Idai. Political patronage become major instruments for regulating access to private and public land in some parts of Chimanimani and Chipinge. Zanu PF politicians and activists were more concerned about procuring and maintaining political support more than securing safe environment for the people. The settlements are as a result of poor land governance and administration, corruption and inadequate housing policies. Therefore, the rural housing policy has the potential to be hindered by administrative, social and even technical constraints, therefore it should be designed in such a way that the people themselves are gradually drawn into the mainstream of the development agenda. Hayes, (2001) defined a public policy as a purposive and consistent course of action produced as a response to a perceived problem of a constituency, formulated by a specific political process, and adopted, implemented, and enforced by a public agency. It is hoped that the nature and form of the rural housing policy would address current poor land governance and corruption. Corruption and poor land governance undermine efforts to ensure better housing structures in rural communities. Rural communities’ strong dependency on land as a resource expose them to corrupt vultures. On the other hand, the policy ought to look at Zimbabwe’s customary laws that deny women of their land rights. The cyclone inflicted damage has left a cohort of widows and orphans. The rural housing policy should enhance the living conditions of rural communities by avoiding wrong policy priorities, institutional and technological variables. Housing is closely linked to a balanced development of rural communities, and a rural policy have an important role in guaranteeing the sustainability of rural housing. For the rural housing policy to be transformational, it is of paramount importance that there must be changes in the inter- and intra-governmental relations and between the public and the private sectors and the civil society. The policy framework should develop a strong co-ordination mechanism. Rural development requires policy framework that is geared towards an overall policy strategy rather than towards the mere formulation of a rural policy. The second key aspect of the rural housing policy is the relationship between government ministries. This makes it easy to co-ordinate and encourage the various governmental departments that implement rural policy to work together. At the same time, consistency is important to ensure that individual policies are not contradictory, and that they converge in a coherent strategy. This implies a strong political will to overcome sectoral tendencies and an overall clarification of roles and responsibilities of different Ministries and/or departments. As Zimbabweans, we need to ask ourselves the following questions. What processes can lead to the design of an effective housing policy community development? What kind of administrative and planning mechanisms are needed at the local level?